I was listening to some music from a popular ministry the other day, and the idea for this article came to me. After the completion of one of the songs, the worship leader began what I affectionately term “praise venting.” “Thank you Jesus! Praise you Jesus! Lord, you are wonderful! Majestic!” Forgive me if I don’t have the quotes down correctly, but you get the idea. “Praise venting” has always bothered me. When I hear it, I find myself thinking, I’m glad he’s enraptured. What’s my problem? Would I ever have the guts to do that publicly? Why does that always sound fake? What am I supposed to do while he’s doing that? While pondering praise venting, I have been reading several books on worship that have stirred my heart on the issue of congregational worship. Thus, I’d like to scratch out my musings (or ventings) in this plea to worship leaders. While I am a pastor, I would like to speak as just an average church member to worship leaders. I have been in church for 33 years, and I have sat under the leadership of more than 10 worship leaders in my home church. Besides that, I have visited more than 100 different churches of all denominations and worship styles. If I calculated the total number of songs I have sung under the leadership of different men (and women) in evangelicalism, the total would be more than 20,000. Suffice it to say, I have experience. Not in leading worship, but in being led. My presupposition is that I believe it is your job to lead the congregation in worship of Almighty God. (This responsibility does not diminish the role of the senior pastor. He is a worship leader as well.) Colossians 3:16 tells the congregation to sing “with grace in your hearts to the Lord.” In Acts 16:25, Paul and Silas, bound in chains, were God-directed in their worship as they “sang praises unto God.” You are facilitator for that noble time when the people of God gather corporately to bear witness to their love for God. Let me also admit my weakness. I am a weak worshiper. I am easily distracted. To stay focused on God during the musical part of the worship service is mental sweat for me. I want to share with you some things that would help me as you attempt to fulfill your responsibility. You can greatly help me and many who sit in churches each Sunday. This is the God who is worthy of our worship. The following pleas will help us stay focused on the glory of our wonderful Lord. Prepare the Service. I don’t know where it happened, but somewhere along the line, some fundamentalists became sloppy with their liturgy. Some of you may be laughing as you read this because you wonder if any Baptist fundamentalists have liturgies. A liturgy is nothing more than a prescribed form for public religious worship. All churches have liturgies: some are careless, some are beautiful. Spontaneity and lack of preparation in preaching have become scorned by fundamentalists, and rightly so. But we seem to tolerate the same carelessness in congregational singing. Perhaps it is because we are “people of the book.” We believe the preaching is the center of the service and thus everything else takes a secondary role. I believe that to be unwise. After Luther split from the Catholic Church, he put great effort into reconstructing a meaningful worship pattern for Protestant churches. He labored to produce a translation of the Scriptures, a catechism, and a hymnal. Music wasn’t a secondary concern. It was vital breath to believers gasping to express God’s truth with their hearts. To relegate any form of worship of the true God to a position of less importance than another is a dangerous misstep. Not long after a church service begins, it becomes increasingly clear how much time the worship leader put into planning the service. All worship leaders plan their services; however, the time one spends in preparation has a huge bearing on the quality of the service. Some may object to the formality of a “liturgy.” Tim Keller, pastor of Redeemer Presbyterian in New York, has some good thoughts. So prepare the service and prepare your heart. Avoid Hard Songs. I was recently in a service where we sang “Blessed Be the Tie That Binds.” I felt like I was on a musical yo-yo. I’m sure musical purists will take me to task on this, but hear me out. Some songs are just difficult to sing. This goes for some hymns and some modern choruses. When I think more about the notes than about the lyrics, that focus leads my thoughts away from God. I start thinking about whether anybody else can hear me as I wonder up, down, and around the note, attempting to hit it. This problem applies not only to music but also to lyrics. Keller says, “Language should not be too archaic. It is dangerous to seek transcendence and dignity by using antiquated language, which can be stuffy, preachy, grandiloquent, pedantic, and over-stated rather than simple, immediate, clear, vivid, and direct.”  He goes on to warn against colloquial language such as describing God as “exciting” or “incredible.” Lastly, he warns against evangelical subculture terminology such as “Let us come unto the Lord” or “We pray for a hedge of protection around him, Lord.” He says, “Subcultural talk is at best highly exclusionary and at worst very phony, a ruse to hide a lack of actual heart engagement.” Songs that are easy to sing will help all of us keep our focus where it needs to be. Make Us Think on the Lyrics. Good worship leaders make the lyrics supreme with the music simply being a platter on which to serve the feast. 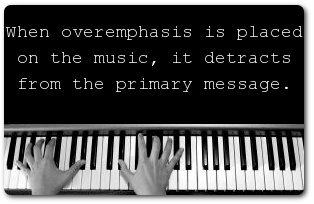 When overemphasis is placed on the music, that overemphasis detracts from the primary message. During instrumental music specials in our church, we project the lyrics on the screen for this very reason. It takes the focus off the performance and places it on the message of the song. Wesley said, “Above all sing spiritually. Have an eye to God in every word you sing. Aim at pleasing him more than yourself or any other creature. In order to do this, attend strictly to the sense of what you sing, and see that your heart is not carried away with the sound, but offered to God continually.”  Good lyrics are essential to good singing, and the best lyrics are pure Scripture. Perhaps the Psalter needs to be revived in fundamental churches. Avoid Cheap Tricks. Sometimes it seems to me that worship leaders find God boring. Because He’s the same throughout the ages, He’s become commonplace to the worshiper. God has been figured out. The awe and wonder have died. Worship leaders portray this attitude when they institute cheap tricks to keep the congregation “engaged.” This may seem odd to you, but the spiritual calisthenics of constant standing up and sitting down gets old. Perhaps it’s because I rarely understand why on some songs I stand and yet during others I sit. Another favorite is when the worship leader asks the ladies sing the second verse. It does not make sense to me. I find myself thinking, I bet you the men are going to have to sing the last, but those ladies sure sound nice. If you are going to have different people sing different parts, explain the intention and make the reason loftier than variety. My thoughts easily drift off God. If you are directing our hearts to the God who holds the universe in place, we should need no false stimulants. These tactics are a simple admission of how truly trite many feel God really is. I personally feel that fundamentalists with conservative worship can be just as performance-centered on Sunday mornings as Willow Creek or Saddleback. One can emphasize excellence to a fault, and the other can emphasize effectiveness to the same fault. Without careful attention, you can train the congregation to focus on the performance or on the performer rather than on God. Sometimes worship leaders can unintentionally draw attention to themselves. Many leaders who are of the hand-waving style of leading have kooky hand flips or stilted arm movements. I sometimes feel like I’m watching a seizure, not song-leading. Mark Dever proposes a healthy solution. Don’t be sensitive. We really are your biggest cheerleaders. We want you to do well. Congregational singing is perhaps the most vivid picture of the life of the Church during a regular service. Even if you are in a local church where creeds and Scripture are recited, these verbal expressions rarely give the sense of the heart of a congregation. However, when the congregation sings, hearts open, and you can really sense the degree to which the congregation is truly serious about the message it heralds. 1. D.A. Carson, Worship by the Book (Grand Rapids, MI: Zondervan, 2002), p. 150. 3. This quote is from Tim Keller in his chapter titled “Reformed Worship in the Global City,” D.A. Carson, Worship by the Book (Grand Rapids, MI: Zondervan, 2002), p. 223. 5. This quote is from R. Kent Hughes, D.A. Carson, Worship by the Book (Grand Rapids, MI: Zondervan, 2002), p. 166. 6. John Wesley, Select Hymns with Tunes Annext: Designed Chiefly for the Use of the People Called Methodists (Bristol: William Pine, 1761, ed. 1770). 7. Mark Dever and Paul Alexander, The Deliberate Church (Wheaton, IL: Crossway Books, 2005), p. 118. 10. D.A. Carson, The Cross and Christian Ministry (Grand Rapids, MI: Baker Books, 2004), pp. 38-39. 11. Dever and Alexander, p. 118. 12. This quote is from R. Kent Hughes, D.A. Carson, Worship by the Book (Grand Rapids, MI: Zondervan, 2002), p. 171.